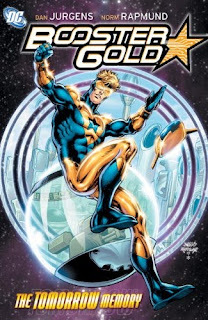 The fifth Booster Gold volume, Booster Gold: The Tomorrow Memory, is another in a series of books highlighting Dan Jurgens's greatest hits, if you like that sort of thing. As a Jurgens enthusiast, I don't mind another trip down memory lane; less ardent fans, however, may find Tomorrow Memory somewhat repetitive. Jurgens admirably gives Booster a distinct personality, but doesn't seem completely sure what to do with the character. Given that Booster Gold used to be the "Bwah-ha-ha" comic relief of the Justice League, it's astounding just how depressed Jurgens presents him in this book, even moreso than the previous volumes. Booster is neither the Superman-esque archtypical superhero, nor the Batman dark hero; Booster is a third kind, the sad hero. The book still derives its humor through witty banter between the characters, but Jurgens recounts (almost too much) everything Booster has to be sad about -- no family, dead friends, and no one in which he can confide. It gives the book a distinct tone that I think is worthy of recognition, but someone expecting the Booster Gold of old might be significantly surprised. The four-part "Tomorrow Memory" story presented second in this book offers an interesting conflict, in that Booster -- angry that Rip Hunter won't let him change time -- has to convince an even more reckless time traveler of the same. Set against the backdrop of Reign of the Supermen's destruction of Coast City, it's easy to follow Booster's growth in the story, and the arguments that Booster and the time-traveler Sonia Crane make for and against saving a mass-murderer to preserve future heroics is the kind of goodness you want from a time-travel comic. The story also gives Dan Jurgens a chance to draw again Coast City, Mongul, and the Cyborg Superman, all right in the thick of some of Jurgens's best Reign of the Supermen work. Jurgens remembers the fine details of that story as well as we fans do, and the references to the Cyborg Superman meeting the president and Mongul creating "Engine City" evoke the nostalgia in full. If you still love that scene where Lois meets the original Cyborg Superman in the rain, you'll love this book -- and that's on top of Jurgens depicting the long-awaited origin of Vanishing Point, the home of the Time Masters set just before the end of all existence. Unfortunately, however, the broad strokes of "Tomorrow Memory" repeat almost exactly a couple of stories from earlier in this Booster Gold series. Booster argues with Rip Hunter about being unable to change time; Booster goes to the past to try to change time, and ultimately fails; Booster and Rip reconcile, but Rip is compelled enough by Booster's argument that he changes a bit of the past as a boon to Booster. This is, to an extent, both what happened to Booster in 52 Pickup when he tried to save Barbara Gordon, and in Blue and Gold when he tried to save Ted Kord; at the end of the latter, Rip returned to life Booster's sister Michelle. As such, for long-time Booster Gold readers, this story will seem predictable, all the more reason why the real draw here is Jurgens nostalgia and not the story itself. The two-part Blackest Night crossover "Dead Ted" that begins Tomorrow Memory doesn't offer much more. Jurgens's peek at Blue Beetle's superhero funeral is wonderfully emotional, but Booster's fight with the resurrected Black Lantern Blue Beetle is surprisingly flat. Given that Ted Kord's death remains the core of the Booster GOld series, one would expect much more nuance from Booster and "Dead Ted"'s meeting, but Booster understands far too quickly that the Black Lantern is not his dead friend. The conflict becomes simply between Booster and a generic bad guy (as have been many of the Blackest Night crossovers), and it's almost surprising how little it contributes to the ongoing Booster Gold story, let alone to Blackest Night itself. Still, I'm a sucker for a good crossover, and Booster Gold: The Tomorrow Memory's final saving grace is that it sets up, in vague fleeting moments, ties to Time Masters: Vanishing Point, The Return of Bruce Wayne, and Flashpoint. I'm reminded of the lead-in to Final Crisis, for instance, where Brave and the Bold: Lords of Luck opined that a Great Disaster was coming -- equally vague and ultimately without any real connection to Final Crisis, but still enough in the early days to send chills down the reader's spine. I'm being pandered to, I know, and it's all in the service of DC getting me to put down my hard-earned change on Flashpoint and all its tie-ins -- but I love this kind of thing nonetheless. Tomorrow Memory ends with a Time Masters teaser, and as Dan Jurgens leaves this title for that one, I'll happily follow along as well. This Booster Gold trade hints at Flashpoint while the next volume ties in to Brightest Day and Justice League: Generation Lost. Yes, there may be Blackest Night tie-in issues here, but it seems the days of the next crossover are already upon us. Love them or hate them, thanks for reading Collected Editions. "and that's on top of Jurgens depicting the long-awaited origin of Vanishing Point, the home of the Time Masters set just before the end of all existence." "This Booster Gold trade hints at Flashpoint." I'm still missing the references to these two events - can you specify with page numbers? I believe the structure that explodes mid-way through the book is what will become Vanishing Point; note the similarities between the buildings, except Vanishing Point looks like it's post-explosion. As for Flashpoint, I interpreted the discussion between Rip Hunter and a guest from the future about something being wrong with the timestream as a reference to Flashpoint, and the end of this book very directly leads in to the new Time Masters: Vanishing Point miniseries by Jurgens. At least that's how I took it all.